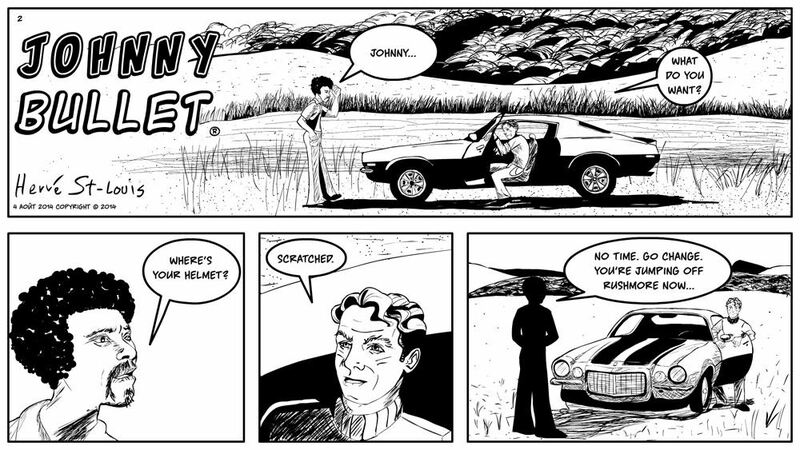 Johnny Bullet is my first Web comic strip and the first comic I’ve worked on in years. I used to draw way more as a kid. It is all I did. I didn’t use to do my homework back then. Drawing is often like a drug. Before I started computer graphics, I would have ghost pains in my guts if I didn’t draw for more than a week. I remember once, I hurt my thumb. It was in a thick bandage for weeks. It was awkward to hold a pencil. Yet, by the end of the first week, I was drawing with a big bandage wrapping my thumb several times. I had no choice. I started switching from paper animation to the Cintiq in 2007 when I worked at a Web 2.0 dot com on a video game. Another animator had insisted on getting a Cintiq. A few months later, we all got one. Animation, especially the kind of Looney Tunes-like animation with crazy movements and gestures that I like to do were much easier. I didn’t have to deal with my 18x12 scanner that kept breaking. Everything was digital. Yet, the transition wasn’t complete. The full transition happened this summer. Johnny Bullet is 100% digital. I have not used any paper to create this comic strip. This is a first for me. At first, I was learning how to use Flash and the Cintiq combo for comic book illustration. I was used to doing animation with a Cintiq and Flash but not a comic book. Comic books are more illustrative. One must spend more time on one panel and add more details to create a good environmental context around the main figures and props. The panel above shows how I struggled with this. I knew how to draw. But I didn’t know how to draw comics using digital tools. Johnny Bullet is what I call a Web comic strip. See, usually, we read about Web comics. Although comic strips have easily found a place from the newspaper to the Web page, they are rarely created for online media first. I find that the comic strip format works much better than the vertically elongated comic book page for digital media. Comic book creators have attempted to replace the printed comic book with tablets. But comic books, I find, still look awkward on desktop computers and mobile phones. Comic strips look good on tablets, desktop computers and smartphones. I’ve thought about this layout and its user experience consequences for years, starting with the first ComicBookBin app I developed way back in 2010. Comic book platforms developers, publishers and creators have not thought about these user experience problems seriously. People still struggle to read Web comics. Because they enjoy the medium they are willing to put up with bad user interfaces. I think the popularity of digital and Web comics would be greater if issues related to user experience worked in their favour. I’ve tested Johnny Bullet extensively on tablets, desktops and mobile phones. It reads well no matter what medium is used. And when I get around to printing it one day, it will be easy to read. I study user experience, so it’s normal for a user experience researcher and practitioner to create a comic strip that is user-friendly! I’ve noticed that successful Web comics tend to publish twice a week. As a doctoral student, that’s a luxury that I cannot afford. I have a short lead on Johnny Bullet. Just a few weeks of backup. I will eventually be late and skip a few weeks. I try to work on Johnny Bullet on weekends and nights, but life gets in the way. It’s a great hobby and again, when I don’t draw for just a few days, I feel that ghost pain in my guts that forces me back at the drawing tablet. The thing about comic strips which comics have long abandoned is a sense of discovery and never knowing where the cartoonist is going next with the story. It’s a journey. Many comics from larger publishers are packaged and sold as mini-series, or as story arcs with set numbering. Vendors think it helps readers make up their minds and commit to a series. I think it takes away all the surprise. In comics, readers know months in advance what the story will be about because of monthly solicitations and previews. Comic strips forgo this. Readers just hop on regularly to check up on what they’ve missed recently.